A 35 year old female comes to the clinic complaining of pain and swelling of one of her fingers. 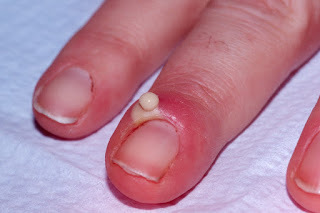 The swelling and pain is just proximal to the finger nail and she has also noticed pus coming from this area. Examination reveals redness, swelling and purulence of the nail fold as shown in the picture above. The area is very tender to palpation. Bacterial paronychia is usually acute in nature and is characterized by swelling, erythema , discomfort and sometimes purulence. The most common cause is Staphylococcus aureus. Treatment requires drainage of a focal abscess if present and oral antibiotic therapy. Chronic paronychia develops from chronic irritant dermatitis and loss of cuticle from trauma or nail care practices. It can also occur secondary to candida infections.